The 2019 Camp Registration Form can be found here. camp fee for your parish. 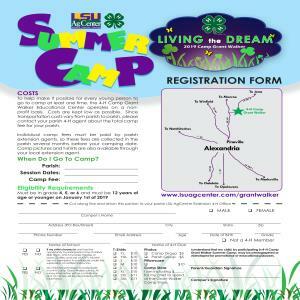 Individual camp fees must be paid by parish extension agents, so these fees are collected in the parish several months before your camping date. Camp pictures and t-shirts are also available through your local extension agent. When Do I Go To Camp? Must be in grade 4, 5, or 6 and must be 12 years of age or younger on January 1st of 2019.